A correct set of retail data is sufficient to figure out if a customer is going to purchase from a store or will visit once again. Whenever folks go out shopping, they want to have an experience which is convenient, informative, and personalized. A retailer cannot provide a personalized experience if he does not have access to retail data analytics technology for obtaining information about particular shoppers and end users. As compared to traditional retailers, e-commerce retailers find it easier to track and obtain information related to individual shoppers. This is because web technology makes it very easy for these e-tailers to gather data regarding customer purchases. Web technology is also able to track the device through which customers access the website. What a customer went searching for from the showcased items to the time he spent on the site, every minute detail can be tracked. All this helps to understand customer persona and preferences at a deeper level. With all this data, e-commerce websites are then able to deliver targeted emails, advertisements and personalized deals for customers, thus luring the customer to check out and make a purchase. Video streaming services like Netflix are great examples where algorithms related to recommended videos drive more user engagement. All these benefits of data analytics are complicated to be derived from a physical store. In short, the absence of data analytics technology can impact the physical store retailers negatively as they may not be able to provide a great experience to customers. Store beacons are a piece of retail analytics technology which is becoming more and more popular in retail stores all over, mainly because of the multiple uses these beacons provide to the retailers. For instance, the tags can figure out those parts of your store that are busiest with the maximum number of customers. This is a small detail, but it can help the retailers to a great extent. Such information can help store owners adjust and modify their display with products which they want the customers to be aware of. Promotional goods, for example, can be placed in areas where the traffic of customers is high usually. The data collected through these beacons can also be used to monitor the traffic at particular hours of the day. A retailer with such a piece of information can plan out the allocation of his workforce and also the best position inside the store to place his items. These beacons can also be well-integrated into the mobile phones of shoppers. Once connected, customers can be sent welcome messages. Not only that, even reminders to purchase some particular items or any promotional offers available can be sent to these customers through the in-store beacons. We are still not done. The beacons also provide help to trace the physical path through which a customer roams in the store while making his purchases. This is again a useful function as it helps to obtain and analyze specific shopping behaviors of particular customers while visiting a retail store. Walmart and Amazon Go stores have already been utilizing this piece of technology to yield significant benefits. Amazon Go, in particular, has tweaked the use of beacon technology. Because these stores operate in a cashless manner, every customer gets a barcode scanned while entering the store. This barcode is on the Amazon Go app in the visiting shopper’s mobile phone. The customers then shop for their items and leave the store. A countless number of cameras inside the store track customers and their behavior. It analyses all information such as what items they picked up, what they finally bought, and the items which they left behind, all of this os crucial information which gets recorded with the help of these cameras. Sophisticated computer systems take the data from the weight sensors to evaluate which products have been removed from a rack. The moment a particular customer leaves the store, they are automatically charged for all the products which they have purchased. This is the closest a retail store can come to an e-commerce website, all of which is possible with the right technology. If new retail analytics and reporting technology are merged cohesively, a considerable amount of data can easily be collected. This data will be capable enough to monitor every little piece of detail related to the behavior and buying preferences of customers. All of this data can be obtained from just one visit from a consumer. Thus, with retail data analytics, stores can create an omnichannel shopping experience for customers. With smart stores, customers can have easy and cashless checkouts. Amazon Go is a great example. It gives customers the same online experience with its high-tech offline store. A lot of innovative products are there to help retailers who wish to have a better understanding of the customers visiting their stores. The issue is that only huge companies have financial resources where they can test and put the new technology-driven solutions to use. The progress of these latest tools for retail analytics and reporting technology is pretty slow. What cannot be denied though, is the fact that technology is essential for any retailer today. If a customer does not receive an experience which is according to his expectations, no retailer will find the customer coming back to his doorstep. Retailers should consider technology as an investment through which they can offer customized options according to customers’ preferences. Brick and mortar stores need to have the best retail technology possible without which retailers will not be able to provide the desired customer experience. If you are looking for data analytics solutions for your business, then GoodWorkLabs can help! 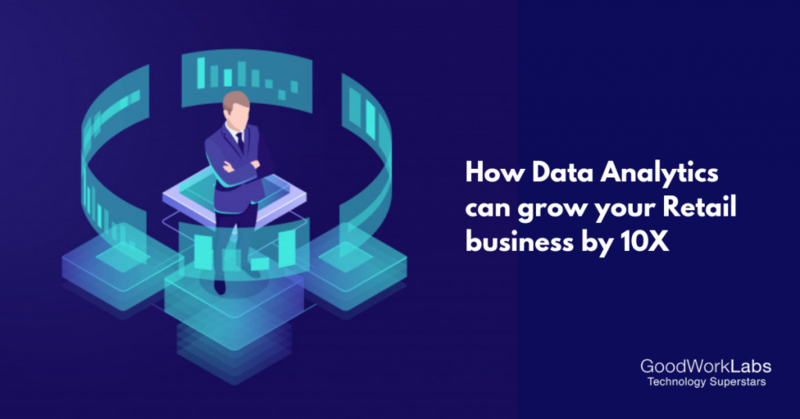 Send us a short message with your requirements and our data analytics team can help you with a free consultation on the best data analytics solution for your business.